Why are there so many types of cut testing methods? Responding is Larry Garner, chief marketing officer, MCR Safety, Memphis, TN. Cut protection is one of the safety glove industry’s fastest growing product groups. To capitalize on today’s technology and innovation, you need to understand the industry’s test methods. Two of the most common cut test methods are the Certified European directive and the Cut Protection Performance Test. Each test method has unique processes and equipment; therefore, it is difficult to make comparisons with each of these methods and results (scores). The CE test method originated from a European directive to establish harmonized standards for all personal protective equipment used in the European market during 2004. 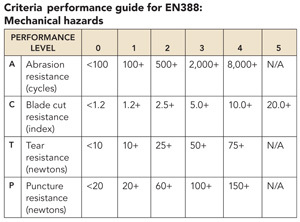 The European Standard EN388 includes four physical tests required for gloves. The results of these tests are included on the product in a four-digit number. Each number represents an individual test for abrasion, cut, tear and puncture resistance. The cut test uses a circular blade under a fixed load, and moves back and forth until cut-through is achieved. Consider the acronym ACT-P as a convenient reference to remembering the four physical tests. The International Safety Equipment Association, in conjunction with the American National Standards Institute, created test protocol known as the ASTM F1790 standard, then revised and updated the protocol as ASTM F1790-97 and ASTM F1790-05. Differences in the 1997 and 2005 revisions are noted in the table below. This Cut Protection Performance Test utilizes a straight razor blade and calculates a gram weight necessary to cut through test material. Three types of testing equipment (CPP, TDM and Couptest tester) are used to support the CPPT and CE standards. This is another reason why it is difficult to make any comparisons between test scores. Independent testing labs are required for CE and CPPT scores. 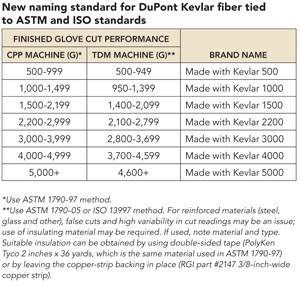 DuPont is championing the use of ASTM and International Organization for Standardization cut protection standards. 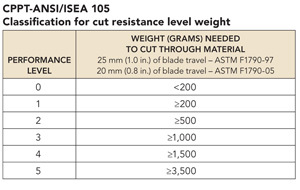 The chart below includes gram weight ranges to endorse suitable levels of cut performance. Note: Testing can be performed on CPP or TDM testers. The International Glove Association created a similar cut test method to the CPPT. 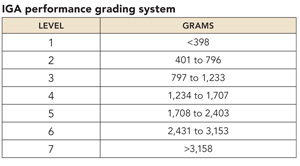 The IGA test method has seven levels of performance with smaller gram ranges for each level. Products certified by IGA will be issued a certification letter listing the registration number, product details, certification of test results and associated certification level. The advances in cut-protection materials are growing faster than our various test methods. Progressions of more cut-resistant materials and manufacturing processes will necessitate revisions for identifying higher levels of cut protection. Look for revisions to these methods in the future.